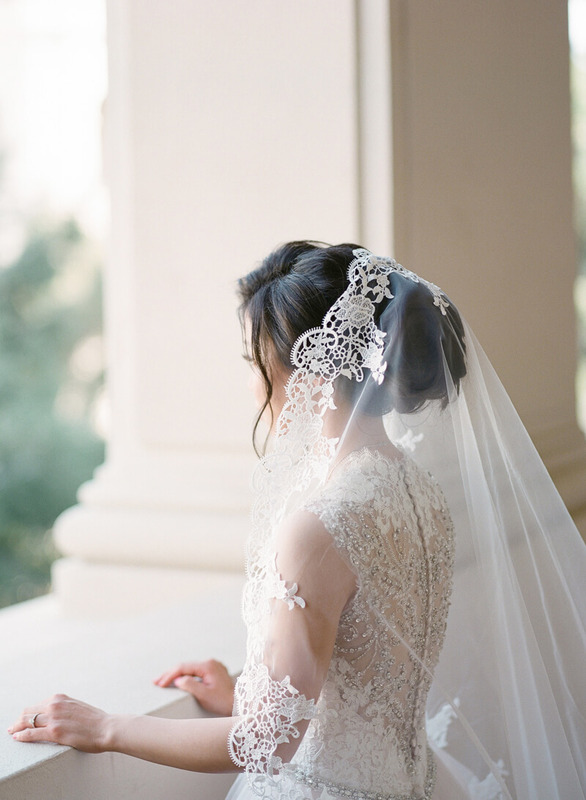 Summer and Dennis’ wedding at the University Club of Pasadena, California, was the epitome of classic elegance. 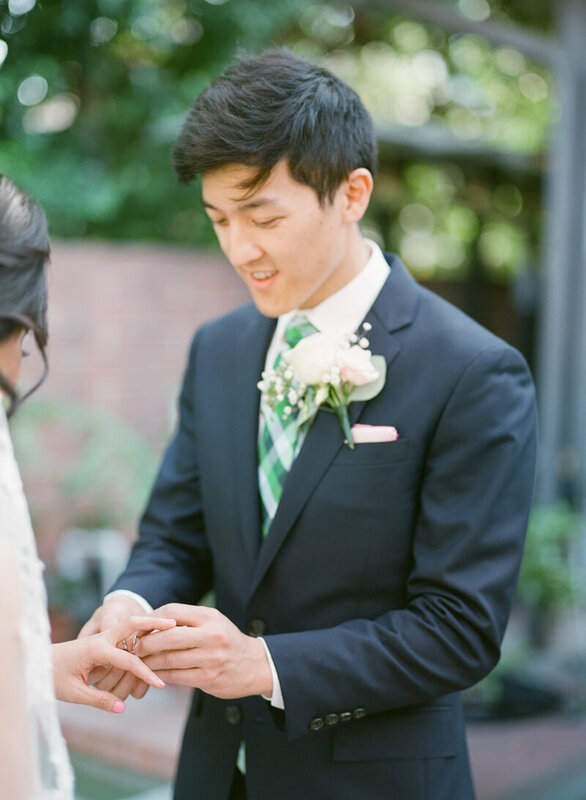 Their entire celebration was outfitted with an emerald green and white color palette and timeless floral arrangements. But the most stunning accent of all wasn’t a table linen, a centerpiece or a candle — it was the beauty of love. Summer and Dennis first met while working in their college mailroom. Fast forward a few years later and the two planned to make their commitment to one another official in a lovely outdoor ceremony. Every detail of Summer’s bridal look was classic and coordinated. 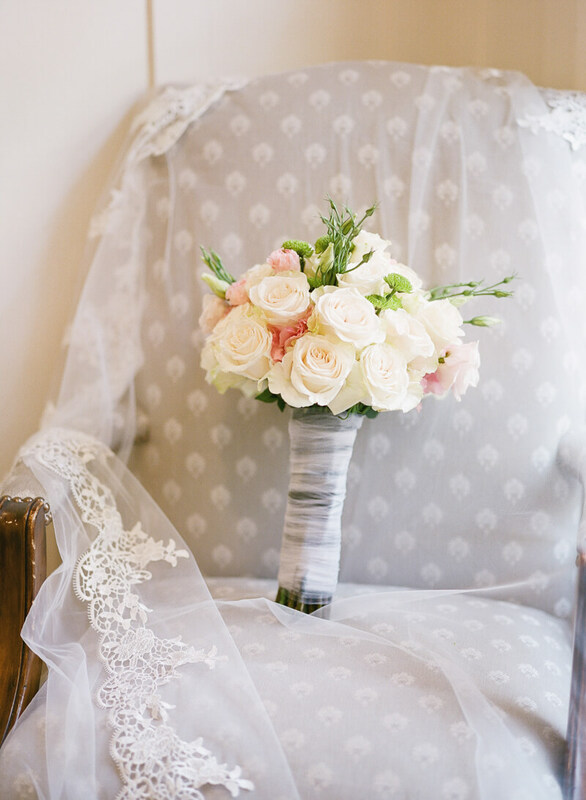 From blush-colored heels to her simple, but stunning rose bouquet, she embodied grace and style on her wedding day. Her gown was fit for a princess. It featured a lace bodice, a dramatic tulle skirt, and show stopping back detail with lace and beading. 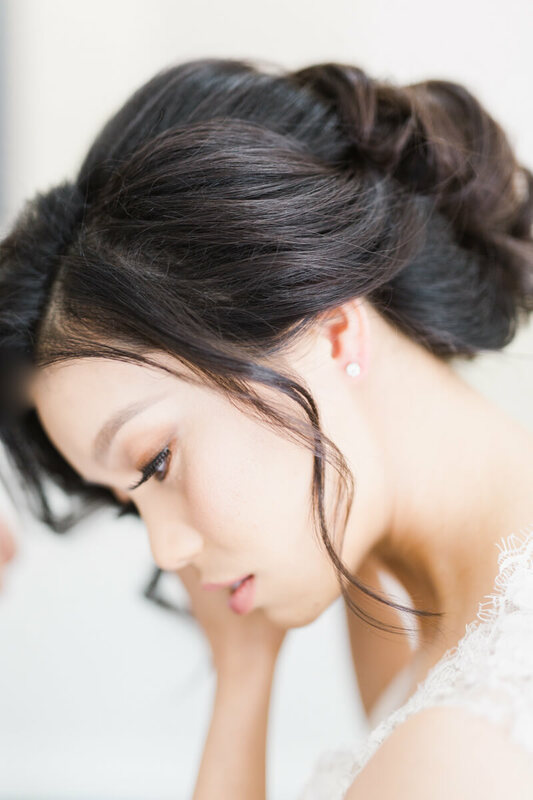 She completed her bridal look with stud earrings and a long lace veil. 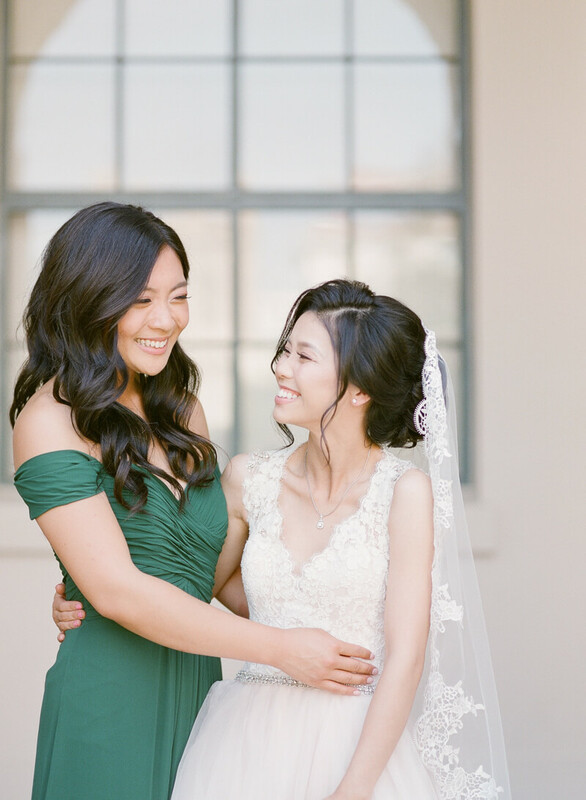 Summer’s bridesmaids were radiant in off-the-shoulder dresses in the wedding’s signature hue and even wore matching hairstyles for a seamless look. 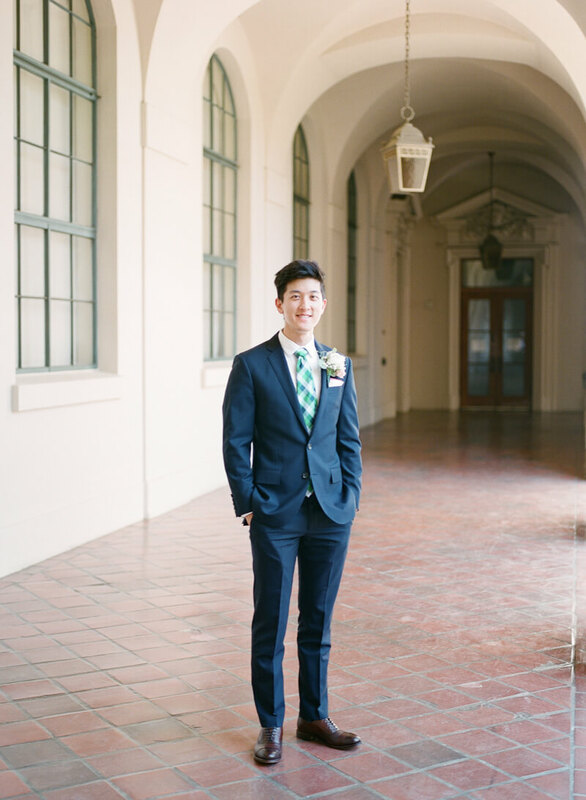 Dennis looked stylish and handsome in a navy blue suit and a green and white plaid tie. The couple opted for a first look moment before the ceremony. All alone, Summer snuck up to an awaiting Dennis. The photographers managed to capture a few different angles of this special moment to truly savor the memory. 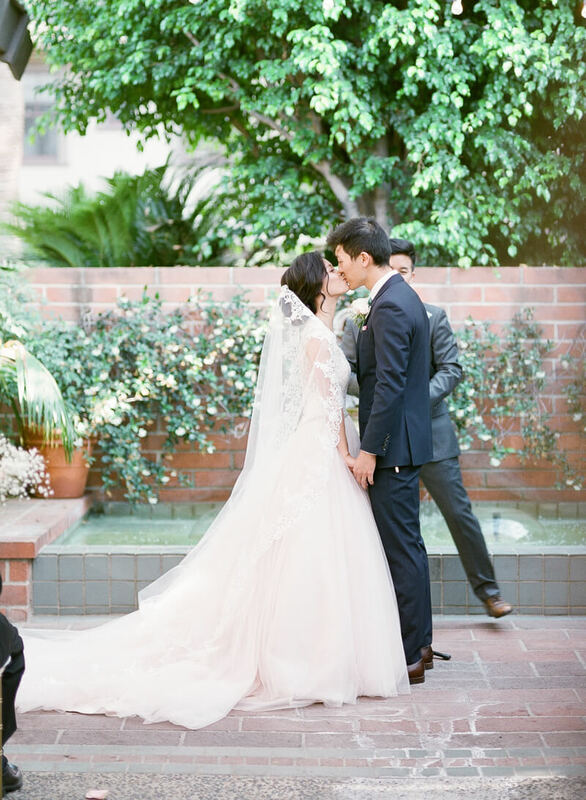 After turning around, Dennis was overcome with surprise to see his beautiful bride, and they shared a kiss before making their way up the club’s grand staircase for more photos. The detail of Summer’s veil was exquisite. The lace hem matched the lace detail on her gown in remarkable fashion. The look of love these two have for one another was captured in every photo. And with many beautiful corners, the University Club of Pasadena provided picturesque backdrops everywhere they went. For the ceremony, the aisle was lined with bunches of baby’s breath and rose petals as guests descended on the patio. Summer and Dennis joined hands and exchanged vows in front of their loved ones. They sealed their promises with a sweet first kiss as husband and wife. The bridal party took photos outside before everyone retreated to the club’s dining room for the reception. Every detail was classic and elegant. From gold chivari chairs to bright white linens, their décor provided timeless brilliance. A two-tier naked wedding cake was adorned with pink and white rosebuds and baby’s breath for a sweet but simple confection. The new Mr. and Mrs. enjoyed their first dance as husband and wife, celebrating the long journey from the college mail room to their wedding day. 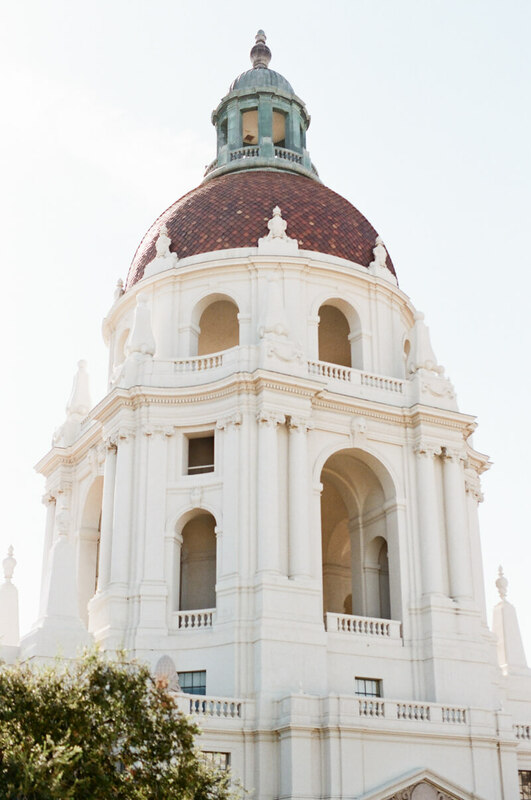 Summer and Dennis’ California wedding day was a timeless celebration of their timeless love story. And much like their love for one another, this wedding will never go out of style. It’ll still be heartwarming and beautiful for decades to come.